Z-Wave is a wireless communications protocol used primarily for home automation. It is a mesh network using low-energy radio waves to communicate from appliance to appliance, allowing for wireless control of residential appliances and other devices, such as lighting control, security systems, thermostats, windows, locks, swimming pools and garage door openers. 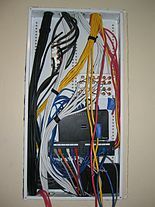 Like other protocols and systems aimed at the home and office automation market, a Z-Wave system can be controlled via the Internet from a smart phone, tablet or computer, and locally through a smart speaker, wireless keyfob, or wall-mounted panel with a Z-Wave gateway or central control device serving as both the hub controller and portal to the outside. Z-Wave provides the application layer interoperability between home control systems of different manufacturers that are a part of its alliance. There are a growing number of interoperable Z-Wave products; over 1,700 in 2017, and over 2,600 by 2019. The Z-Wave protocol was developed by Zensys, a Danish company based in Copenhagen, in 1999. That year, Zensys introduced a consumer light-control system, which evolved into Z-Wave as a proprietary system on a chip (SoC) home automation protocol on an unlicensed frequency band in the 900 MHz range. Its 100 series chip set was released in 2003, and its 200 series was released in May 2005, with the ZW0201 chip offering a high performance at a low cost. Its 500 series chip, also known as Z-Wave Plus, was released in March 2013, with four times the memory, improved wireless range, and improved battery life. The technology began to catch on in North America around 2005, when five companies, including Danfoss, Ingersoll-Rand and Leviton Manufacturing, adopted Z-Wave. They formed the Z-Wave Alliance, whose objective is to promote the use of Z-Wave technology, with all products by companies in the alliance interoperable. In 2005, Bessemer Venture Partners led a $16 million third seed round for Zensys. In May 2006, Intel Capital announced that it was investing in Zensys, a few days after Intel joined the Z-Wave Alliance. In 2008, Zensys received investments from Panasonic, Cisco Systems, Palamon Capital Partners and Sunstone Capital. Z-Wave was acquired by Sigma Designs in December 2008. Following the acquisition, Z-Wave's US headquarters in Fremont, California were merged with Sigma's headquarters in Milpitas, California. On January 23, 2018, Sigma announced it planned to sell the Z-Wave technology and business assets to Silicon Labs for $240 million, and the sale was completed on April 18, 2018. In 2005, six products on the market used Z-Wave technology. By 2012, as smart home technology was becoming increasingly popular, there were approximately 600 products using Z-Wave technology available in the US. As of January 2019, there are over 2,600 Z-Wave certified interoperable products. Z-Wave's interoperability at the application layer ensures that devices can share information and allows all Z-Wave hardware and software to work together. Its wireless mesh networking technology enables any node to talk to adjacent nodes directly or indirectly, controlling any additional nodes. Nodes that are within range communicate directly with one another. If they aren’t within range, they can link with another node that is within range of both to access and exchange information. In September 2016, certain parts of the Z-Wave technology were made publicly available, when then-owner Sigma Designs released a public version of Z-Wave's interoperability layer, with the software added to Z-Wave's open-source library. The open-source availability allows software developers to integrate Z-Wave into devices with fewer restrictions. Z-Wave's S2 security, Z/IP for transporting Z-Wave signals over IP networks, and Z-Ware middleware are all open source as of 2016. The Z-Wave Alliance was established in 2005 as a consortium of companies that make connected appliances controlled through apps on smartphones, tablets or computers using Z-Wave wireless mesh networking technology. The alliance is a formal association focussed on both the expansion of Z-Wave and the continued interoperability of any device that utilises Z-Wave. In October 2013, a new protocol and interoperability certification program called Z-Wave Plus was announced, based upon new features and higher interoperability standards bundled together and required for the 500 series system on a chip (SoC), and including some features that had been available since 2012 for the 300/400 series SoCs. In February 2014, the first product was certified by Z-Wave Plus. The alliance aims to create for the smart home a secure mesh network that works across different platforms. Z-Wave is designed to achieve reliable communication and operation between devices and sensor-enabled objects from various manufacturers in the Z-Wave Alliance, which consists of over 700 members. Principal members of the alliance include ADT Corporation, Alarm.com, Assa Abloy, Fibaro, Huawei, Ingersoll Rand, Jasco, Leedarson, LG Uplus, Nortek Security & Control, Silicon Labs, and SmartThings. In 2016, the Alliance launched a Z-Wave Certified Installer Training program to give installers, integrators and dealers the tools to deploy Z-Wave networks and devices in their residential and commercial jobs. That year, the Alliance announced the Z-Wave Certified Installer Toolkit (Z-CIT), a diagnostics and troubleshooting device that can be used during network and device setup and can also function as a remote diagnostics tool. Z-Wave Alliance maintains the Z-Wave certification program. There are two components to Z-Wave certification: technical certification, managed through Silicon Labs, and market Certification, managed through the Z-Wave Alliance. Z-Wave is designed to provide reliable, low-latency transmission of small data packets at data rates up to 100kbit/s. The throughput is 40kbit/s (9.6kbit/s using old chips) and suitable for control and sensor applications, unlike Wi-Fi and other IEEE 802.11-based wireless LAN systems that are designed primarily for high data rates. Communication distance between two nodes is about 30 meters (40 meters with 500 series chip), and with message ability to hop up to four times between nodes, it gives enough coverage for most residential houses. Modulation is by Manchester channel encoding. Z-Wave uses the Part 15 unlicensed industrial, scientific, and medical (ISM) band. It operates at 868.42 MHz in Europe, at 908.42 MHz in the North America and uses other frequencies in other countries depending on their regulations. This band competes with some cordless telephones and other consumer electronics devices, but avoids interference with Wi-Fi, Bluetooth and other systems that operate on the crowded 2.4 GHz band. The lower layers, MAC and PHY, are described by ITU-T G.9959 and fully backwards compatible. In 2012, the International Telecommunication Union (ITU) included the Z-Wave PHY and MAC layers as an option in its G.9959 standard for wireless devices under 1 GHz. Data rates include 9600 bps and 40 kbps, with output power at 1 mW or 0 dBm. The Z-Wave transceiver chips are supplied by Silicon Labs. Z-Wave uses a source-routed mesh network architecture. Mesh networks are also known as wireless ad hoc networks. In such networks, devices use the wireless channel to send control messages which are then relayed by neighboring devices in a wave-like fashion. The source device wanting to transmit is therefore known as the initiator. Hence, the name source-initiated mesh ad hoc routing. There were several source-initiated mesh routing protocols proposed in the period early 1990s. The earlier ones were Ad hoc On-Demand Distance Vector Routing (AODV) and Dynamic Source Routing (DSR)..
Devices can communicate to one another by using intermediate nodes to actively route around and circumvent household obstacles or radio dead spots that might occur in the multipath environment of a house. A message from node A to node C can be successfully delivered even if the two nodes are not within range, providing that a third node B can communicate with nodes A and C. If the preferred route is unavailable, the message originator will attempt other routes until a path is found to the C node. Therefore, a Z-Wave network can span much farther than the radio range of a single unit; however, with several of these hops a slight delay may be introduced between the control command and the desired result. The simplest network is a single controllable device and a primary controller. Additional devices can be added at any time, as can secondary controllers, including traditional hand-held controllers, key-fob controllers, wall-switch controllers and PC applications designed for management and control of a Z-Wave network. A Z-Wave network can consist of up to 232 devices, with the option of bridging networks if more devices are required. A device must be "included" to the Z-Wave network before it can be controlled via Z-Wave. This process (also known as "pairing" and "adding") is usually achieved by pressing a sequence of buttons on the controller and on the device being added to the network. This sequence only needs to be performed once, after which the device is always recognized by the controller. Devices can be removed from the Z-Wave network by a similar process. The controller learns the signal strength between the devices during the inclusion process, thus the architecture expects the devices to be in their intended final location before they are added to the system. Typically, the controller has a small internal battery backup, allowing it to be unplugged temporarily and taken to the location of a new device for pairing. The controller is then returned to its normal location and reconnected. Each Z-Wave network is identified by a Network ID, and each device is further identified by a Node ID. The Network ID (also called Home ID) is the common identification of all nodes belonging to one logical Z-Wave network. The Network ID has a length of 4 bytes (32 bits) and is assigned to each device, by the primary controller, when the device is "included" into the Network. Nodes with different Network IDs cannot communicate with each other. The Node ID is the address of a single node in the network. The Node ID has a length of 1 byte (8 bits) and must be unique in its network. The Z-Wave chip is optimized for battery-powered devices, and most of the time remains in a power saving mode to consume less energy, waking up only to perform its function. With Z-Wave mesh networks, each device in the house bounces wireless signals around the house, which results in low power consumption, allowing devices work for years without needing to replace batteries. For Z-Wave units to be able to route unsolicited messages, they cannot be in sleep mode. Therefore, battery-operated devices are not designed as repeater units. Mobile devices, such as remote controls, are also excluded since Z-Wave assumes that all repeater capable devices in the network remain in their original detected position. Z-Wave is based on a proprietary design, supported by Sigma Designs as its primary chip vendor, but the Z-Wave business unit was acquired by Silicon Labs in 2018. In 2014, Mitsumi became a licensed second source for Z-Wave 500 series chips. Although there have been a number of academic and practical security researches on home automation systems based on Zigbee and X10 protocols, research is still in its infancy to analyze the Z-Wave protocol stack layers, requiring the design of a radio packet capture device and related software to intercept Z-Wave communications. An early vulnerability was uncovered in AES-encrypted Z-Wave door locks that could be remotely exploited to unlock doors without the knowledge of the encryption keys, and due to the changed keys, subsequent network messages, as in "door is open", would be ignored by the established controller of the network. The vulnerability was not due to a flaw in the Z-Wave protocol specification but was an implementation error by the door-lock manufacturer. On November 17, 2016, the Z-Wave Alliance announced stronger security standards for devices receiving Z-Wave Certification as of April 2, 2017. Known as Security 2 (or S2), it provides advanced security for smart home devices, gateways and hubs. It shores up encryption standards for transmissions between nodes, and mandates new pairing procedures for each device, with unique PIN or QR codes on each device. The new layer of authentication is intended to prevent hackers from taking control of unsecured or poorly-secured devices. According to the Z-Wave Alliance, the new security standard is the most advanced security available on the market for smart home devices and controllers, gateways and hubs. The chip for Z-Wave nodes is the ZW0500, built around an Intel MCS-51 microcontroller with an internal system clock of 32 MHz. The RF part of the chip contains an GisFSK transceiver for a software selectable frequency. With a power supply of 2.2-3.6 volts, it consumes 23mA in transmit mode. Its features include AES-128 encryption, a 100kbps wireless channel, concurrent listening on multiple channels, and USB VCP support. For smart-home wireless networking, there are numerous technologies competing to become the standard of choice. Wi-Fi consumes a lot of power, and Bluetooth is limited in signal range and number of devices. Other network standards competing with Z-Wave include Wi-Fi HaLow, Bluetooth 5, Insteon, Thread and ZigBee. Z-Wave has a long open-air operating range at 90 meter (outdoor) and 24+ meter(indoor). Insteon has a large number of maximum devices capability at 17.7 million (to ZigBee's 65,000 and Z-Wave's 232). Thread has a fast data transmission rate at 250 kbps. Z-Wave has better interoperability than ZigBee, but ZigBee has a faster data transmission rate. Thread operates on the busy Wi-Fi standard frequency of 2.4 GHz, while Z-Wave operates at 908 MHz in the US, which has reduced noise and a greater coverage area. ZigBee operates on both 915 MHz and 2.4 GHz frequencies. All three are mesh networks. The Z-Wave MAC/PHY is globally standardized by the International Telecommunications Union as ITU 9959 radio, and the Z-Wave Interoperability, Security (S2), Middleware and Z-Wave over IP specifications were all released into the public domain in 2016, making Z-Wave highly accessible to Internet of Things developers. ^ Harold Stark, "The Ultimate Guide To Building Your Own Smart Home In 2017," Forbes, May 22, 2017. ^ a b c Oliver Kaven, "Zensys' Z-Wave Technology," PC Magazine, January 8, 2005. ^ a b c d e f Lou Frenzel, "What's The Difference Between ZigBee And Z-Wave?" Electronic Design, March 29, 2012. ^ a b c "Smarten up your dumb house with Z-Wave automation". Digital Trends. 2013-11-07. Retrieved 2016-03-12. ^ a b Roger Pink, "ZigBee vs Z-Wave for the IoT," Electronics 360, May 4, 2017. ^ a b "Z-Wave Alliance Hosts Interactive Smart Home Pavilion at CES 2019". nbc-2.com. Retrieved 9 January 2019. ^ "What is Z-Wave?". lifewire.com. Retrieved 9 January 2019. ^ a b c d Amy Westervelt, "Could Smart Homes Keep People Healthy?" Forbes, March 21, 2012. ^ a b c d e f g David Ehrlich, "Sigma Designs Buying Smart Network Chipmaker Zensys," GigaOm, December 18, 2008. ^ a b Olivier Hersent, David Boswarthick and Omar Elloumi, The Internet of Things: Key Applications and Protocols, West Sussex: John Wiley & Sons, chapter 8, 2012. ^ a b Patrick Mannion, "Intel funds Z-Wave developer Zensys," EE Times, May 1, 2006. ^ Michael Brown, "Sigma Designs announces next-gen Z-Wave home-control product family," TechHive, March 19, 2013. ^ "Episode 151 - Discussing Z-Wave with Executive Director Mitch Klein". HomeTech.fm. Retrieved 2017-03-07. ^ Kevin J. O'Brien, "Home of the Future Still Years Away," New York Times, September 5, 2012. ^ a b "Silicon Labs Completes Acquisition of Sigma Designs' Z-Wave Business". Silicon Labs. Retrieved 2018-04-23. ^ a b James Morra, "Z-Wave Specifications Go Open-Source," Electronic Design, September 7, 2016. ^ Brian X. Chen, "Smartphones Become Life's Remote Control," New York Times, January 11, 2013. ^ "Sigma Designs and Z-Wave Alliance Introduce New Z-Wave Plus™ Certification Program - Z-Wave Alliance". 22 October 2013. ^ "Leak Gopher Z-Wave Valve Controller". ^ a b Laura Hamilton, "Z-Wave Alliance Announces Board Member and New Security Mandate," CED Magazine, December 22, 2016. ^ "Member Companies of the Z-Wave Alliance - Z-Wave Alliance". Z-Wave Alliance. Retrieved 2016-03-12. ^ "Z-Wave Certified Installer Toolkit". residentialsystems.com. Retrieved 9 January 2019. ^ "Get Certified with Z-Wave". silabs.com. Retrieved 9 January 2019. ^ "About Z-Wave Technology". March 2013. Retrieved 2013-05-13. ^ a b c d Mikhail T. Galeev (2006-10-02). "Catching the Z-Wave | Embedded". embedded.com. Retrieved 2015-07-26. ^ Online, Sigma Designs. "Z-Wave : Home control". www.sigmadesigns.com. Archived from the original on 2014-07-17. Retrieved 2016-03-12. ^ "Territories". products.z-wavealliance.org. Retrieved 9 January 2019. ^ Johnson, D.; Y. Hu; D. Maltz (February 2007). "RFC 4728: The Dynamic Source Routing Protocol (DSR) for Mobile Ad Hoc Networks for IPv4". IETF. Retrieved March 19, 2018. ^ Loughlin, Thomas (2012-11-22). "Z-Wave Christmas Lights". Thomas Loughlin. Retrieved 3 December 2012. Any further and I would see a slow down in the control of any device on the network. We did get it to work at about 130 feet but it took about 3 minutes for the device to get the on/off message. ^ "Understanding Z-Wave Networks, Nodes & Devices". Vesternet.com. Archived from the original on 2012-12-13. Retrieved 2012-11-19. ^ "Z-Wave Becomes Multi-Sourced Standard as Home Control Market Heats Up Globally," sigmadesigns.com, January 2, 2014. ^ a b Fouladi, Behrang; Ghanoun, Sahand (2013). "Security Evaluation of the Z-Wave Wireless Protocol" (PDF). Sense Post. ^ Picod, Jean-Michel; Lebrun, Arnaud; Demay, Jonathan-Christofer (2014). "Bringing Software Defined Radio to the Penetration Testing Community" (PDF). BlackHat USA. ^ William Wong, "Q&A: S2's Impact on Z-Wave and IoT Security," Electronic Design, January 17, 2017. ^ Ry Crist, "Z-Wave smart-home gadgets announce new IoT security standards," CNET, November 17, 2016. ^ Ry Crist, "Your Z-Wave smart home gadgets just got more secure," CNET, April 3, 2017. ^ Ken Briodagh, "Mandatory Security Implementation for Z-Wave IoT Devices Takes Effect," IoT Evolution, April 4, 2017. ^ "Z-Wave 500 series," Aeotc.com. Accessed July 30, 2017. ^ Kevin Parrish, "ZigBee, Z-Wave, Thread and WeMo: What's the Difference?" Tom's Guide, July 14, 2015. ^ a b Brandon Lewis, "Z-Wave opens up as smart home connectivity battle closes in," Embedded Computing Design, September 2, 2016. This page was last edited on 9 March 2019, at 04:50 (UTC).